It looks like we're about to lose another iconic tech brand: Sony's saying goodbye to the PC and selling off its Vaio computer division. It's a victim of what Sony calls "drastic changes in the global PC industry", and it's a real shame for a range that boasted Steve Jobs in its fan club. Vaio's logo represents the move from analogue to digital technology - the VA is an analogue wave, the IO binary - and the brand helped make PCs fun after more than a decade of beige boxes. The first Vaio landed in the early 90s and the PCG-505 showed the best and worst of Sony: a terrible naming system attached to a really nice product. Where other firms gave you a choice of beige or black, Sony's first generation Vaio came in bluey-purple - and it did so in a case that, for the time, was incredibly thin and light. Add in an unusual cylindrical battery and co-ordinated add-ons and you had something considerably more interesting than other firms' fare. That wasn't the only odd or interesting thing from Sony. And most recently, the Vaio Flip hybrids and the Vaio Tap tablets. And that's just the computer line: over the years Sony has also delighted us with mad-looking MiniDisc machines, the decidedly odd Rolly rolling alarm clock and the much-missed Aibo robot dog. I've long thought of Sony as the mad Apple, a firm that not only makes beautifully engineered, bomb-proof products but that also gets wildly overexcited and puts out really odd things for the sheer hell of it. 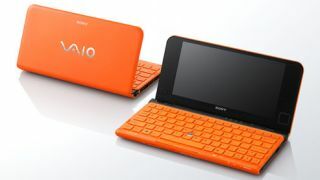 Orange laptops! Robot dogs! Alarm clocks you have to chase around the house! In most firms, ideas like that would be laughed at. Sony launched them. That's why it's a shame that the Vaio brand appears to be going. The mad machines may have been in the minority, but at least Sony made them. The world of tech will be that little bit duller without them.